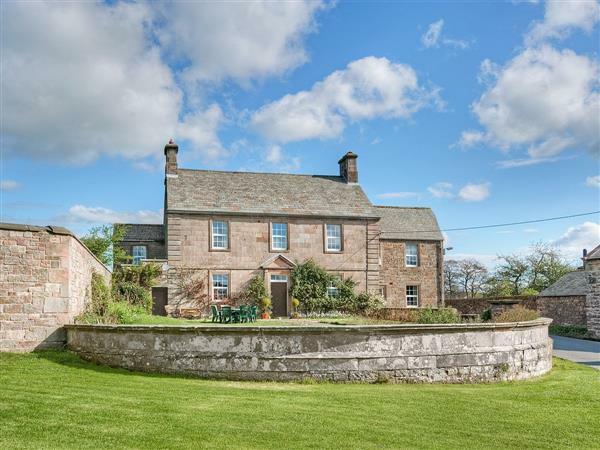 Overlooking the pretty village green at the entrance to Greystoke Castle Estate, this stunning, Georgian, semi-detached holiday home is beautifully presented with original features and generously proportioned rooms. Greystoke lies on the north east edge of the Lake District National Park in the Eden Valley and is 4 miles from the traditional market town of Penrith. There are delightful walks on the estate and cyclists will enjoy winding through the attractive villages and wild flower-laden country lanes. Ullswater, known as the most romantic lake, and the Keswick area with its spectacular high fells, are both within a 20-minute drive. This location is ideal for outdoor enthusiasts and those wishing to unwind in a beautiful, relaxing and peaceful setting. Shop, pub and restaurant 50 yards. Ground floor: Living room. Dining room with flagstone floor. Kitchen. Utility/drying room. Conservatory. Separate toilet. First floor: 4 double (6ft zip and link, can be twin) bedrooms, three with en-suite bathroom with shower over bath and toilet, one with en-suite shower room with toilet. Woodburner in living room included. Oil central heating, gas, electric, bed linen and towels included. High-chair (on request). Freeview TV with surround sound. DVD. Blu-ray. CD. Range. Gas hob. Electric oven. Microwave. Washing machine. Tumble dryer. Dish washer. Fridge/Freezer. Enclosed garden with sitting-out area and furniture. Shared natural and wooded grounds with cycle route. Ample parking. No smoking. Holidays run from Friday to Friday. NB: River in grounds, 100 yards. For a better idea of where Algars Garth is, you can see Algars Garth on the map below. Algars Garth is in Cumbria; should you be on the lookout for a special offer, you can find all the special offers in Cumbria. It's always worth checking to see what is on offer at the moment. Do you want to holiday near Algars Garth (28085), you can see other cottages within 25 miles of Algars Garth; have a look to find your perfect holiday location.